Before a vote on the measure, there will be a public meeting on carrying concealed guns on Texas college campuses. Texas lawmakers are weighing a bill that would allow professors and students to carry concealed weapons on college campuses. Before the voting begins, a public meeting on the measure will be announced soon on the legislature's site, searchable by #sb354. "This is about self-defense," said San Antonio Republican Sen. Jeff Wentworth, the legislation's sponsor. "It's about protecting lives of students who are totally vulnerable and defenseless and able to be picked off by a deranged shooter, as was the case in Virginia." Virginia Tech is the deadliest school shooting in U.S. history. The second-deadliest happened in 1966 when Charles Whitman killed 16 people and wounded 31 at the University of Texas at Austin. A student and former U.S. Marine, Whitman picked off some of his victims from his perch in a campus tower. Most recently in Texas, a student fired an assault rifle in September at the University of Texas. He killed himself, but no one else was hurt. "The Virginia shooter was mentally deranged. The people who would be able to carry weapons on campus, if this passes, would be licensed, and therefore fully trained," he said. "To get a license in Texas, you have to be 21, go through a 10-hour course and pass an exam, and go out on a shooting range with a handgun and pass a test. One would have to undergo a criminal background check and pay a fee of more than $100, Wentworth said. "People do not lightly apply for licenses," he said. "We would have responsible, trained people there in the classroom." 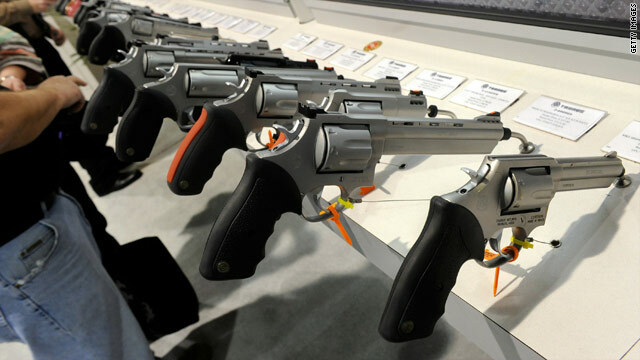 Opponents of the bill are concerned that more guns would mean more violence. Critics include two Virginia Tech students who barely escaped Cho's rampage. "I was there that day. It was the craziest day of my life with one person walking around with two guns," Colin Goddard told reporters last week when he spoke out against the bill at the Texas Capitol. "I can't even imagine what it would have been like with multiple students and multiple guns." Goddard was shot four times and survived by playing dead. He wrote about his opposition to guns on campus for CNN.com in January. Former Tech student John Woods, whose girlfriend was killed in the shooting, joined Goddard in Texas to say he, too, is against the bill. All of you that say the schools neat metal detectors and more security I want to know how you could make that work. Students carry lots of metal; electronics, change, belt buckles, the odd pocket knife, and I don't know what else. You would create to many issues of having thousands of students having to empty their pockets and bags every time they leave and enter the buildings. On the subject of police and guards, of all the campuses I've been on their seemed to be adequate security; in all honesty you can't have an office or guard in every room and if you did they would have to be plainclothes, be assigned everyday to the same rooms, and basically be a student anyway because they would be target #1 for any psycho looking to prey on the unarmed students. Also with the constant budget problems that pretty much every city and state is having how could any of this possibly be paid for? The only real option is to let those people that have been trained and licensed to carry nearly everywhere else to also carry on campus. Realistically you don't know just how many people you bump into everyday have a gun on their person and you never hear about the big Hollywood shootouts that the detractors want you to believe happens at the drop of a hat. It may not be a perfect solution but you have to work with what you have. Before anyone starts ragging on me for the typos in paragraph one you know I meant need and too instead of neat and to. I apologize for not catching those before I hit post. I would like to know the idiocy that creates the fallacy that carrying a handgun on a college campus is OK. I am dead set against this bill for the following reason: why should I come to a classroom to teach when my life can be endangered by the angry student not happy with the grade he earned? Well, now he can pull his gun and bully me into giving him the grade he doesn't deserve. THIS IS NOT RIGHT!!!!! The idiots trying to pass this law should also allow those handguns into the Texas Legislature. Oops, that will never happen. But, I guess that's not infringing on people's rights. Whoever said that teenagers are responsible enough to carry a gun? And, please, look at the statistics of murders that occur in homes with guns in them. Duhh! As a chl holder and a college student, I am a big supporter of this bill. All of these nay sayers need to take a look at the liscencing process to obtain a chl in texas, a 10 hour class, a range test, a test on gun laws, a state and federal back ground check, finger printing, a photo for state data base, a list of where you have lived and worked for the past 10 years. There are so many hoops to jump through, and the state and feds leave no stone unturned in the background check. I have a wife and kid to come home too and I want to be sure I wont be a fish in a barrel at some nuts turkey shoot, I want to be able to defend myself and I will defend anyone else if the situation deems it necessary. The chl is not a vigilantee permitt we have even more laws we have to follow, we have to dot our i and cross our t, or we go to jail for long long time with the very criminals we are trying to defend society against. It is better to have a gun and not need it than to need a gun and not have it. When seconds count the police are minutes away. I tell you what buildafence. I invite you to teach on a college campus for several years with students too lazy to work for a grade who then argue incessantly with you to "give them a break." Some of them get offensive and offer violence and stalk their instructors. Do you honestly think that makes us feel safe? Now, if that same student has a gun... Additionally, it has been my experience that when a gun is pulled people hide and don't pull their own gun. It's called survival and is a biological condition that is very difficult to overcome with logic. Training is what overcomes "flight" reactions. It's why the military and police go through the training they do. Even then, there is no guarantee that they will pull their weapon either. And those that are trained, look at some of the shootouts that have happened. One in L.A. comes to mind where 40+ shots were fired between police and suspects. Not one of them hit a person. Thank God it was where there wasn't a crowd! Justification for carrying any weapon does not exist. And these same people also often have the nerve to call themselves Christians. What happened to Christ's teachings in this argument? I don't recall anything Christ said that involved "hey, he's got a gun, so I can carry one too!" Somehow, I recall the "turn the other cheek" philosophy. There is one other biological condition to consider, it's called "knee jerk"–that's when the brain shuts down and indignation happens. It may apply! people are crying about how dangerous it would be just like how they cried that the streets would run red with blood when CHG certificates took effect. I am educated enough to now not to be a hero but just protect my self. that what its all about. Running away from guns is like running away from biochemistry and advanced pharmacology. When you get to med school you wont be able to function as a doctor. Sadly ive had to use my CHG, id rather have had it and used it then not have had it at all. All i say is that more drunk college kids kill innocent people each year by drunk driving than CHL carriers do. look at the statistics and you will see. see how many college kids have DUI's you might surprise yourself. i'd like to a change in the bill allowing only teachers to carry firearms on campus. if an individual is so inclined to bring a gun to school no matter the intent what is going to stop them?